We love the world of weird and wonderful iPhone accessories but they should at least be something that is of use, say hello to the new product called “UpperCup”. UpperCup is a weird iPhone cup holder that has a built-in case for the iPhone to sit in whilst housing your cup of tea or coffee, and personally we think this is funny but also stupid and cannot see it catching on. It just gets stranger by the minute, we thought we seen it all when we saw the Ramen Soup Bowl – The UpperCup iPhone cup holder is a Indiegogo project that has a $25,000 goal, once this is reached then the Natwerk marketing company based in Amsterdam can go ahead and put it into production, the project has 35 days left running and so far has only raised $765, to be honest it would have been higher if it was a useful product. 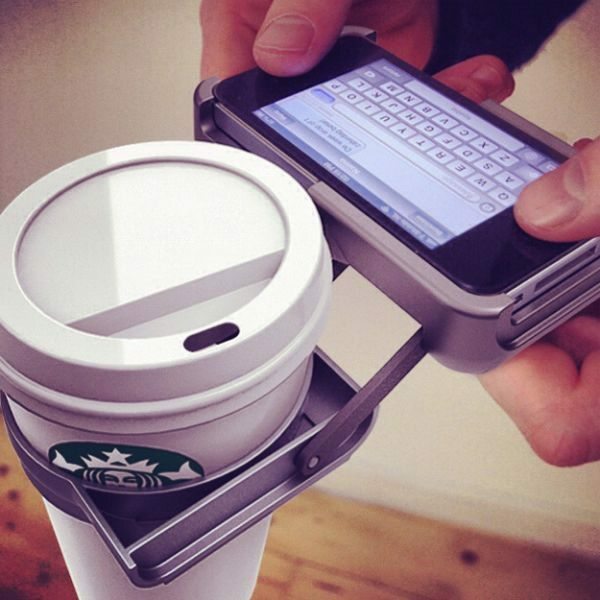 Ok the thought of holding your cup of coffee whilst still having the ability to text etc on your iPhone at the same time is a nifty idea, but we would not be seen using this in public (Sorry Guys). Think about this for a minute, you put your nice shiny expensive iPhone in the case, then you slip your nice hot coffee or tea in the built-in cup holder and for some unknown reason you slip or get bumped and the whole thing drops out of your hand, what do you think will happen to your iPhone? It will not get damaged by way of bumps, drops etc, but it will get soaked with a nice hot drink. Would you donate to the project to see the UpperCup on the market? Texting and having a coffee, come on most people use one finger when texting or calling someone. Please watch the video below and then let us know what you think of the iPhone cup holder called the UpperCup?